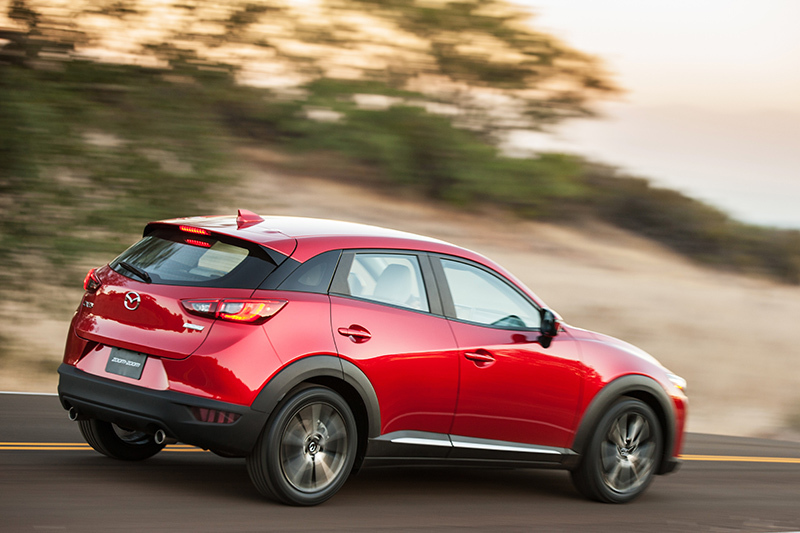 Mazda debuts the 2016 Mazda CX-3 at the 2014 Los Angeles Auto Show. The new compact crossover SUV is the fifth model in Mazda’s line-up of new-generation vehicles that feature the full range of SKYACTIV Technology and KODO—Soul of Motion design. The CX-3 offers all the essentials people look for in a vehicle; a design of overwhelming quality and style, packaging developed solely with the customer’s ease-of-use in mind, and the responsive driving feel that Mazda strives for in every model. In pursuing a design of beauty and sophistication, the essence of KODO—the expression of life within a vehicle—has been evolved to produce a sharper form with an enhanced sense of speed. In the interior, meticulous attention to detail regarding the materials used has created a cabin environment of impressive sophistication and quality. In terms of driving performance, the CX-3 adopts the full suite of SKYACTIV technologies, carefully crafted to match human sensibilities. This realizes driving pleasure with faithful response as well as excellent environmental and safety performance. With Mazda’s latest design and technology, the Mazda CX-3 is a vehicle to suit the customer’s creative lifestyle in any scene, from inner-city driving to enjoying the great outdoors. The model will go on sale globally, starting from Japan in spring 2015 and is expected to become a new core model in Mazda’s line-up. The CX-3 design pursues beauty and sophistication, while expressing Mazda’s KODO design language in the most stylish fashion. Its powerful and highly vital form creates a pure expression of the vehicle Mazda’s designers themselves wanted, one that is not fettered by conventional classifications of vehicle type. The design team worked to create a straight expression of beauty and radical styling for the exterior. Achieving this involved an uncompromising approach to refining the proportions that form the foundation of its beauty and painstaking efforts to eliminate every unnecessary element. For the interior as well, a concerted effort to achieve the appropriate expression to the ambience and fine textures of the materials used realizes a high-quality, sophisticated cabin environment. 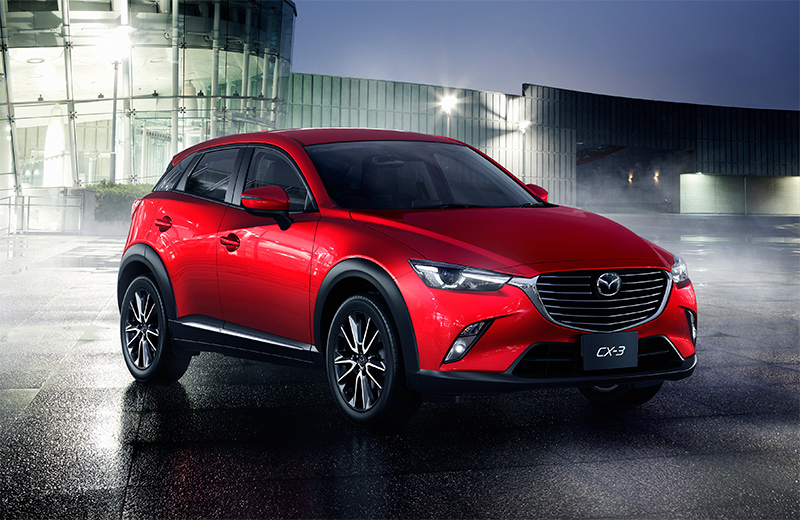 The front view of the CX-3 is designed to present a bold look that suits the model’s stylish proportions. The front grille stacks seven fins with silver-painted front edges to create an expression of concentrated energy that flows horizontally. The signature wing is stout and three-dimensional, as if machined from solid metal. It forms the starting point for a powerful sense of speed that flows across the entire body. With the peak of the front fenders pushed rearward to lie beneath the base of the A-pillars, the side view of CX-3 conveys a sense of extended body size, far greater than the vehicle’s actual dimensions. Careful attention was devoted to creating the rich expression and subtle changes in each of the body surfaces for the following three sections. The front half of the body features a long nose with a flowing shape; the cabin section presents a sleek look achieved by blacking out the D-pillars; and the solid mass at the rear of the body conveys a look of strength and power. 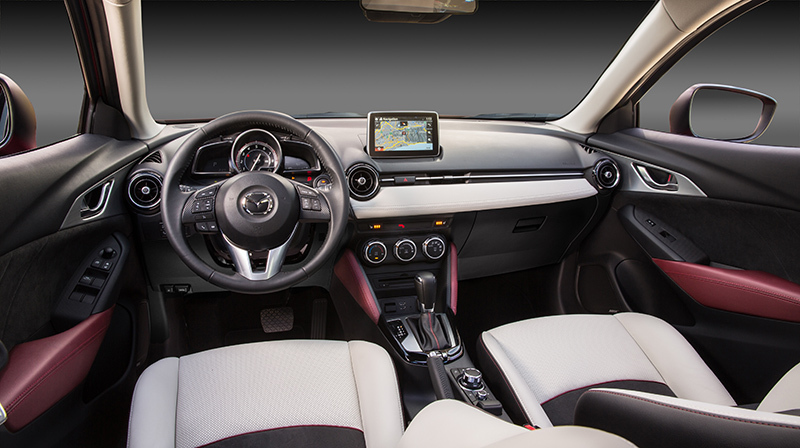 In addition to applying the latest iteration of the KODO design language to realize stylish proportions, CX-3 development also secured an adequate amount of space. The aim was to achieve a package that properly represents Mazda’s vision of what a vehicle should be. 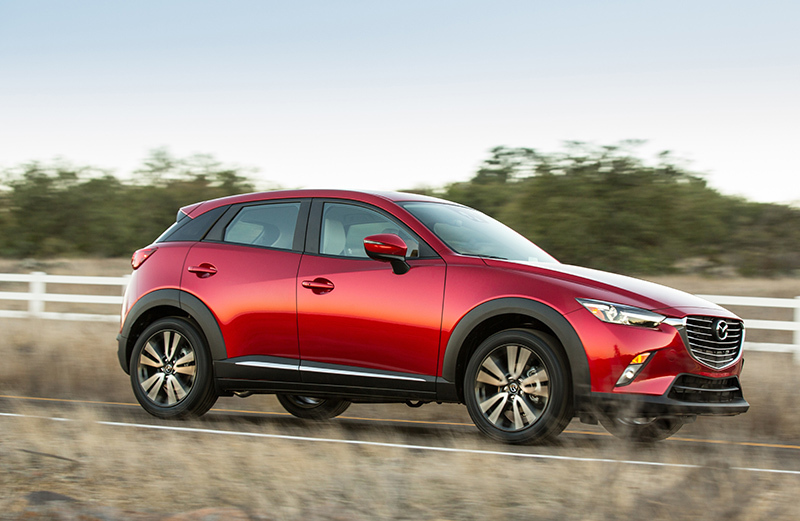 As a result, the CX-3 offers ease of use that is unique to its crossover SUV packaging. It provides drivers with the clear view they need, is easy to enter and exit, and realizes a seating position with a low center of gravity that lends a reassuring sense of confidence when driving. It also adopts the advanced Mazda Connect connectivity system, which supports the customer’s active lifestyle. Great effort went into achieving optimum positioning of each control device. Meticulous adjustment of the shift knob’s positioning on top of the floor console allows the driver to transfer their hand smoothly between it and the steering wheel, and to operate it smoothly and easily without applying excessive force. The commander control features a palmrest that promotes operating stability. Mazda’s new-generation HMI pursues safety as its top priority. The cockpit design is based on the Heads-up Cockpit concept, which aims to help drivers process large amounts of information while maintaining the correct driving position and concentrating on driving safely. 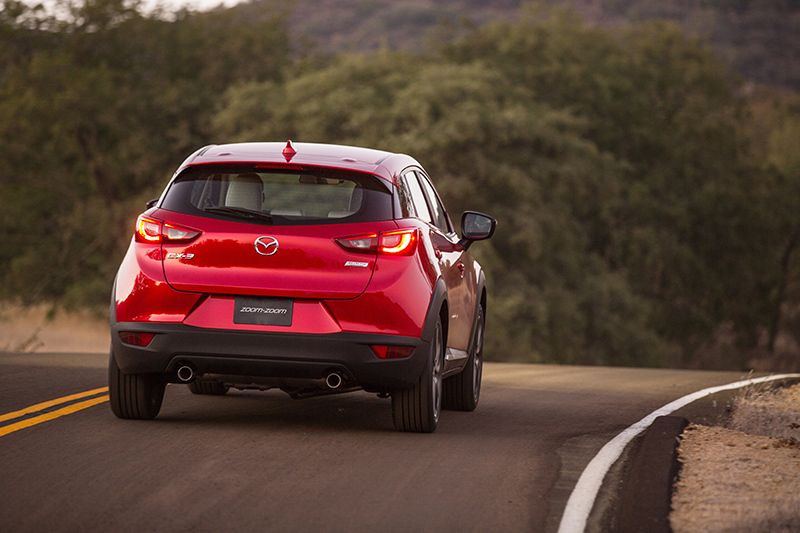 Mazda is in constant pursuit of driving pleasure and faithful response to the driver’s will. Having the vehicle respond exactly as expected to the driver’s actions connects directly to the pleasure of the Jinba-Ittai driving experience and cannot be achieved merely with power and speed. Based on this philosophy, the CX-3 development team focused on delivering ease of handling on city streets, reassuring confidence on the highway, and particularly on faithful response when negotiating gently curving rural roads. By fully adopting SKYACTIV Technology and tuning all the characteristics to match human senses, Mazda produced light, linear response to the driver’s actions along with the handling stability that the Jinba-Ittai experience requires. The powertrain offering for North America is Mazda’s SKYACTIV-G 2.0. Also introduced is a new-generation AWD system. Powerful dynamic performance with linear response and excellent environmental performance provides unrestricted driving enjoyment. Adoption of Mazda’s i-ACTIVSENSE advanced safety technologies, which use sensing devices such as milliwave radar, ensures the driver can enjoy safe driving in any scene, whether driving on city streets, on the highway, or on winding roads. The CX-3 employs Mazda’s high-strength SKYACTIV-BODY, which effectively absorbs impact energy from any direction to suppress cabin deformation. This delivers collision safety performance capable of earning high-level ratings in tests performed by organizations in different regions. •A variety of safety equipment and mechanisms are employed to protect occupants in the event of an accident. This includes an SRS airbag system, a front seat structure that firmly supports the occupant’s head, and door armrests designed to absorb impact energy.